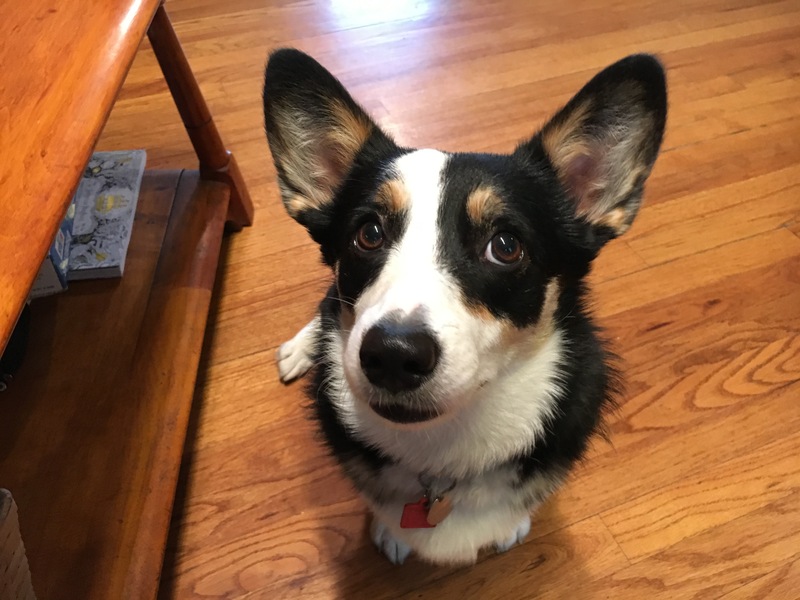 Pip is a ten-month-old Corgi who lives with a family in Omaha. Her guardians set up this puppy behavior training session to do some teach her to stop being aggressive to unknown dogs. Pip lives with a pair of miniature Schnauzers, but the Corgi was the primary focus on this session. Things started out great as Pip was calmer than her Schnauzer counterparts when I knocked on the front door. I sat down with Pip and her guardians to discuss the session and the dog behavior problems that required the services of a dog behaviorist. It turns out that Pip’s guardians did not take her to puppy socialization class. This is a very common mistake many of my clients make. I would estimate 90% of the people who call me for help with a dog they got as a puppy did not take it to puppy socialization class. Social skills are very important to dogs as they are one of the ultimate social creatures. Developing social interaction and problem solving skills is something puppies need to practice at a young age. Failing to do so often results in a puppy who grows into a dog who is reactive when it sees other canines simply because it doesn’t know how to act around them. In some cases this reactive display or aggressive behavior is a bluff; trying to act tough to get the other dog to avoid approaching. In other cases, it becomes a full blown case of dog aggression. Because Pip is still a puppy, I’m guessing this is more of a situation of not knowing how to interact with dogs she doesn’t know. I recommended that the guardians sign Pip up for the counterconditioning class Dog Gone Problems will start offering in June. This class will help Pip create a positive association with unknown dogs who are approaching her. This puppy training will go a long ways towards helping her develop more appropriate social skills. To prep them for this class, I showed them how to train their dog to look up at them and Focus on command. I forgot to film this part of the session, but you can watch a video where I train a dog to focus with this link. It will be important for the guardians to practice the Focus exercise a few times a day every day. This will allow them to gradually start increasing the time it takes to deliver the second treat. Mastering the Focus exercise at home is imperative as the dog has to be able to reliably focus on demand before trying this outside of the house. Inside your home, your level of interest to your dog is close to a ten. But when you are outside, it drops significantly; especially if there is something more interesting nearby like a rabbit, squirrel, etc. By adding in rules, boundaries and structure, we were able to help Pip start to see her guardians in a more authoritative light. This is another crucial component in rehabilitating a dog with dog aggressive behaviors. Many times, a dog who sees his humans as peers thinks it needs to protect the humans from other dogs. A few minutes after leaving the session, I realized I forgot to film Pip’s Roadmap to success so I used my phone stand to record it on my way to teach the Dog Gone Problems puppy socialization class. You can watch the shaky video below.